Emmanuel Macron repudiates Trump’s political philosophy and worldview after spending the first part of the week kissing, hugging, and holding hands with him. On Wednesday, before a joint session of of Congress, the charismatic French leader turned around and repudiated the US President’s political philosophy and worldview. The startling contrast between Macron palling around with Trump on a state visit and his velvet hammer speech — effectively defending the world order from “America First” nationalism — encapsulated his intricate US strategy. Macron wants to bind the Trump administration into the existing Western international system, to convince it to dive back into multilateral efforts to shut down Iran’s nuclear program, to battle climate change and to safeguard globalization and free trade. Before French President Emmanuel Macron delivered an address at a joint meeting of Congress on Wednesday, the headlines about his trip to Washington centered on his apparent “bromance” with President Trump. On Tuesday, the duo engaged in a series of physical embraces and celebrated both their personal rapport as well as the “unbreakable” bonds between France and the United States. Macron went on, urging his American audience to look beyond borders and walls. “We can choose isolationism. But closing the door to the world will not stop the evolution of the world,” he said. And he bristled at the rise of autocrats and illiberal democrats, which include some leaders favored by Trump: “I don’t share fascination for new strong powers and the illusion of nationalism,” he said. 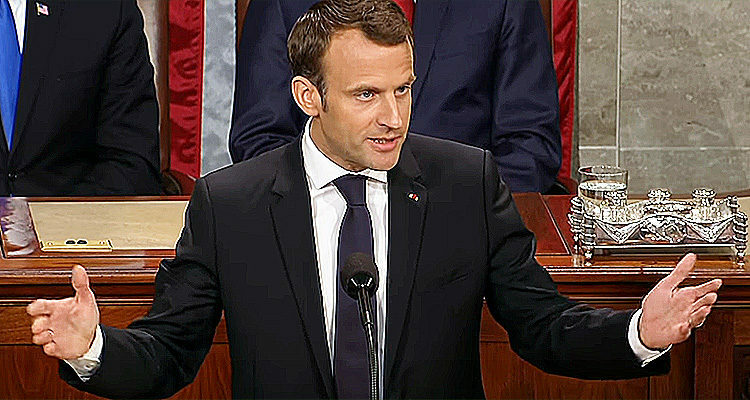 More broadly, Macron presented himself to the US legislature as an unabashed advocate of the liberal world order of global institutions and free trade – the very opposite of the America First nationalism that fuelled Trump’s rise to the White House. The speech – delivered in English – was interrupted by frequent standing ovations, many from both sides of the aisle. CNN reported that: “Macron also summoned legacies largely ignored by Trump. He used his moment in Congress to celebrate the work of James Baldwin, Richard Wright and other icons of the civil rights struggle in America. Not long thereafter, he toured the Martin Luther King Jr. memorial in Washington with Rep. John Lewis (D-Ga.), a civil rights hero who branded Trump a “racist” earlier this year. “Human rights, the rights of minorities and shared liberty are the true answers to the disorder of the world,” Macron said to Congress. In a separate article, The Washington Post provided transcripts to portions of the speech, noting that there were several incidents where Macron sounded Barack Obama.